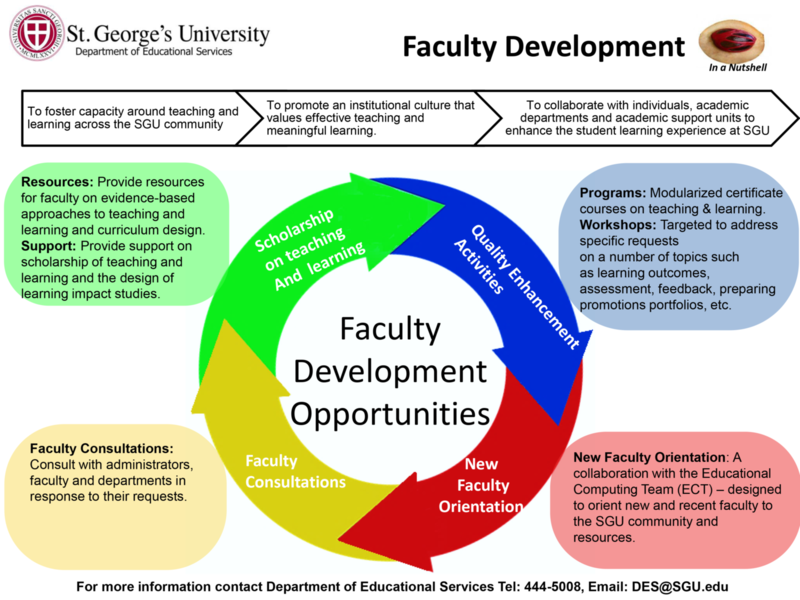 The Department of Educational Services (DES) plays a key role in supporting all students and faculty at SGU, and the academic and professional success of all our students is our primary goal. Comprised of many dedicated academic professionals, DES’s unique and highly effective faculty is the largest on campus. Close to 100 percent of the University’s students and many of the professors in all schools avail themselves of the support offered through the department’s innovative programs, including time management, note-taking skills, and utilizing technology effectively in teaching and learning, as well as individualized programs with training in reading efficiency and comprehension, writing, oral communication, pronunciation, and grammatical accuracy. Most fundamentally, DES assists students individually and in groups as they prepare for course and licensure examinations. DES is a central and established part of the academic culture at SGU, and the department works closely with all schools and programs, as well as with the Dean of Students Office, to provide custom-tailored support regarding academic and non-academic issues. DES also offers a faculty development program designed to support faculty in their pursuit of excellence in scholarship, teaching and learning with seminars and workshops in new and evolving methods of instruction. The Specialized English Language Program (SELP) is a support program designed to help SGU students and faculty develop their language skills. We offer courses, programs, workshops, and individualized sessions in writing, reading, and oral communication. We also review and provide feedback on written documents such as grant proposals, CVs, personal statements, reports, and research papers. individual and small group tutoring sessions. basic grammar and sentence structure. These courses are reading and writing intensive programs for premedical and preveterinary students. PMED302 develops students’ ability to read, understand, and evaluate research studies; to summarize, paraphrase, and synthesize published work; and to practice organizing and expressing ideas clearly and concisely. PMED303 develops students’ skills in critical thinking and professional communication, and helps students gain strategies for evaluating and forming arguments. This program offers regularly scheduled workshops and individual tutoring and consultations for SGU graduate students who want to improve their academic writing. SELP instructors offer workshops, written feedback, and individual tutoring to support students with their CVs and personal statements for residency applications. Writing a CV and personal statement for residency application. Individualized support based on your specific needs. SELP can also create custom workshops and individualized tutoring to suit your needs! The Supplemental Learning (SL) Program runs weekly small group review sessions, hosts an assortment of on-line modules and small group facilitator training workshops to facilitators and Clinical Tutors, and provides general support to SGU’s collaborative learning community. Supplemental Learning small groups are provided for pre-professional and undergraduate students who want to deepen their understanding of course material, improve long-term learning, and improve their grades in large sized pre-professional courses that are traditionally most rigorous. The program is designed to assist students by developing learning communities, integrating study strategies, and applying effective test-taking skills. The Supplemental Learning Program schedule is announced in class during the first week of classes each term. Students are allocated to groups depending on their program and course schedule. The SL faculty attend classes along with the students and frequently make announcements regarding the schedule and examination reviews. Collaborative learning in small groups is a practice that has gained increased popularity at SGU. Small group collaborative learning is supported by numerous studies and by positive student feedback at SGU. In order to ensure excellent well-run small groups, DES offers several SAKAI training modules for Facilitators located at the True Blue and Northumbria campuses. Help facilitators make their sessions more efficient and effective. Anticipate collaborative learning issues and proactively resolve them. Make sessions enjoyable and creative for all participants. The Supplemental Learning (SL) Program focuses on the techniques surrounding the facilitation of the group review sessions. We also train small group observers and visit groups to see how they are doing and give constructive advice. The SL program conducts several hands-on training workshops for DES Facilitators and Clinical Tutors each term. These sessions are designed to compliment the above training modules. They are an opportunity for new facilitators and clinical tutors to practice working in small groups. They also help facilitators to brainstorm, reflect and plan their upcoming sessions together with awarded returning facilitators, other clinical tutors, SL faculty, and their peers. The Academic Enhancement Program (AEP) is a support program for selected students in their first year in the School of Medicine or School of Veterinary Medicine. This retention initiative includes review group sessions, personal advising, and access to other DES programs as needed. AEP is a proactive support initiative that includes review group sessions, personal advising, and access to other DES programs as needed. Students are placed into the program by the Board of Admissions for a variety of reasons, including being out of school for an extended period of time prior to beginning medical school, lower MCAT scores or lower science GPA or lack of experience with multiple choice exams. The program provides the student with additional guidance and resources during their first year of medical or veterinary medical school. Students are enrolled in the regular, full academic program in medical or veterinary medical school, but are mandated to participate in additional learning activities. AEP students must meet with their Faculty Advisor after midterm examinations, and at other times as scheduled throughout the term. Students must attend one AEP review session (restricted to AEP students only) and one DES review session (open to all students) per week. DES Group Review Sessions provide learning opportunities for all students. As outlined above, attendance at Group Review Sessions is mandatory for students enrolled in the AEP program; for all other students, attendance is optional. DES offers over 150 Term One group review sessions a week, meeting over 2000 sessions per term. The DES Student Support Academic Office (SSAO) recruits and selects group review session facilitators and tutors. All applicants for these positions must have completed the course at SGU with an A or B grade, and have a good overall GPA. The DES Learning Skills Program was designed to provide all students with the opportunity to evaluate and improve their academic skills, becoming more efficient and effective learners. Common issues include: Time Management, Test Taking Skills, Focus, Stress and Anxiety Management, and Taking/Making Notes. Practical application of study methods to specific academic curricula in order to develop new study skills and techniques. Learning styles assessment and application, including memory techniques. Time management strategies to keep up with coursework. Test-taking strategies for multiple choice questions (MCQ) in order to improve test preparation and performance skills. Students are offered an opportunity to improve their overall test-taking skills through workshops and/or individual meetings. These meetings address ways to prepare for MCQ exams as well as techniques to use during the exams. It is hypothesized that good test-taking skills can improve exam scores from 5 to 15 percent. MISSION: To support faculty in their pursuit of excellence in scholarship, teaching and learning. SGU is a Learning Community. Teaching is a central role for all faculty; student learning is a primary goal of the University. In keeping with SGU’s mandate and vision, the certificate program, offered by the Department of Educational Services (DES), is designed to help academics develop a scholarly approach to their work as they engage in conversations and practical applications of evidence-based pedagogy for course design, assessment practices and teaching and learning strategies. Teaching activities, and student learning are primary roles for university faculty, however, most academics begin their teaching career with expertise in their content area but little or no prior opportunity to ‘think’ about how students learn. Whether new to teaching or experienced faculty, most have had limited opportunities to systematically develop their teaching abilities, build a scholarly knowledge base about teaching and reflect on how the various elements of their teaching practices fit together. The Basics and Beyond Certificate Program in University Teaching Certificate is designed to provide such opportunities. Each session in the program is designed to be practical, encouraging academics to apply what they are presently learning to their work as teachers to support student learning. For further information about the program and to register for sessions, please contact Ms. Reba David at rrdavid@sgu.edu or download the brochure. DES programs at SGU have been selected as award winners by the National Academic Advising Association (NACADA), a US-based international organization that represents more than 11,000 members from all 50 United States, Puerto Rico, Canada, and many other countries. Members include faculty, advisors, counselors, administrators, and students – all working to promote and support the educational and academic development of students. In 2015, when SGU’s Academic Enhancement Program (AEP) was awarded by NACADA for its innovative advising and academic support program. In 2011, when NACADA acknowledged SGU’s Supplemental Learning Program for its efforts connected to collaborative learning. In 2003, for the School of Medicine premedical program, becoming the first Caribbean institution outside of Puerto Rico to be recognized.